Your skin deserves to look its best. With our line of scrubs and body wraps your skin will looks its best. 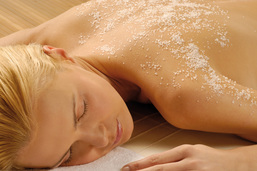 Our body treatments are designed to help slough off old skin so that new skin can grow and look it best. Reveal your skins natural beauty by removing dead skin cells with salt derived locally from minerals from the Great Salt Lake. This treatment will leave your skin feeling refreshed and softer than ever before. The session is followed by a warm shower and a skin hydration with body butter. 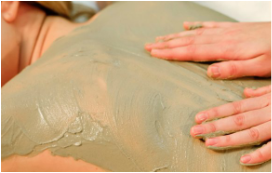 This treatment includes Virginia white clay from Southern Utah that detoxifies, fights free radicals, promotes collagen and elasticity and aids in slowing down the aging process. Scented with essential oils of rose, sandalwood, and frankincense this treatment will leave your skin looking new and revitalized.